Peptide-based epitope mapping is a powerful tool for the identification of immunogenic sites within the drug molecule. In general protein-based therapeutics are highly selective and biocompatible. Consequently, they enjoy relatively low failure rates in development: about a quarter of biopharmaceuticals successfully pass clinical trials (Ecker et al., 2015, mAbs). Despite their undisputable advantages, in clinical trials biopharmaceuticals occasionally induce unwanted immune responses – production of anti-drug antibodies (ADAs). Immunogenicity thus decreases or eliminates the drug’s efficiency and efficacy and can even prohibit its approval for use in humans, as ADAs can cause allergic reactions and severe adverse effects. Given the importance of assessing drug immunogenicity sets of methods that identify and characterize ADAs need to be developed. Several techniques mainly targeted at charting the response at large are available, yet lack the resolution to allow differentiation between different types of ADAs, e.g. those that affect drug effects or those that may be asymptomatic. CLIPS Precision Epitope Mapping also enables identification of structure-specific ADAs, a key advantage over simple linear mapping techniques. Pepscan peptide arrays allow performing full substitution analysis on identified ADAs epitope sequences. This easily identifies single residue substitutions, which allow grasping the breadth of ADA binding to the sequence of the biotherapeutic. Results of epitope mapping studies allow detailed assessment and tight control of the ADA populations in patient samples during all stages of drug development. 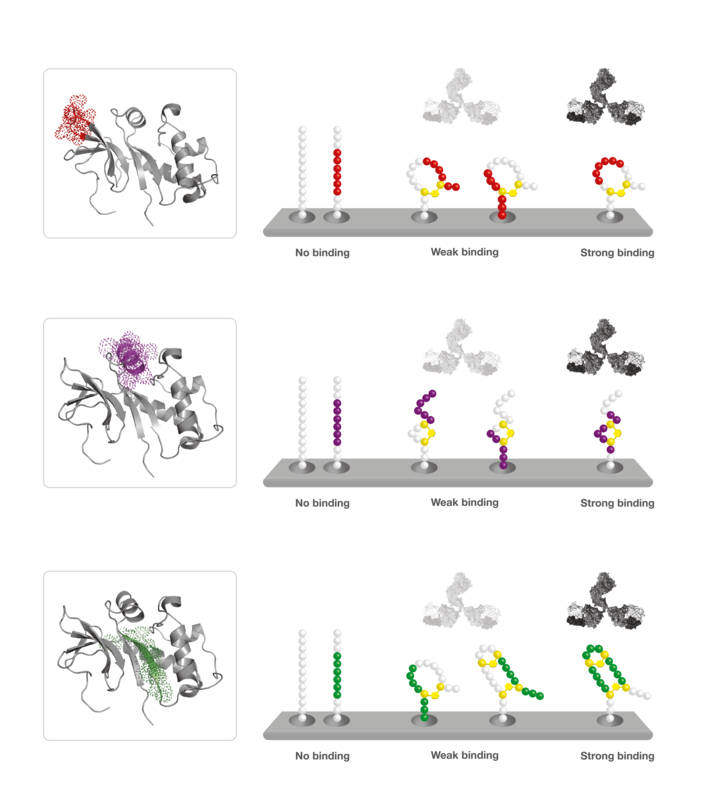 In certain cases, epitope mapping results may inspire elimination strategies, alterations to the therapeutic, or allow finding those subgroups of patients who do not possess neutralizing antibodies. To demonstrate how epitope mapping can help to analyze ADAs in a set of clinical samples we mapped peptide binding intensities obtained for 23 patient samples on a library of 400 peptides designed from a protein drug sequence. Intensity profiles for each sample were averaged, scaled and then clustered. The resulting heatmap is shown below. 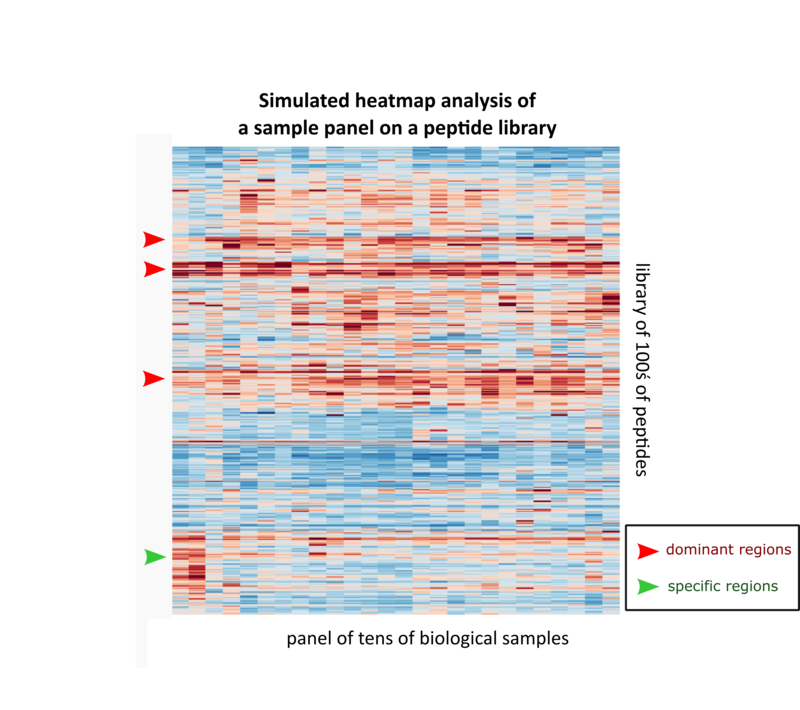 Heatmap analysis showing the polyclonal response from patient sera. Each column corresponds to the response for a certain sample on all peptides and each row corresponds to the response obtained for all samples with one peptide. Data were scaled and clustered. Red arrows indicate regions that are commonly recognized by antibodies in all samples and green arrow indicates a region which is uniquely recognized only by certain patients (possibly, neutralizing antibodies). The heatmap shows that antibody binding profiles may point to the presence of four immunogenic regions within the drug molecule – three dominant regions (red arrowheads) and one specific region (green arrowhead) present only in certain samples. The latter potentially represents a population of ADAs which may neutralize the drug’s action.